The typical mini-lathe comes with a 3 inch 3 jaw self centering chuck. 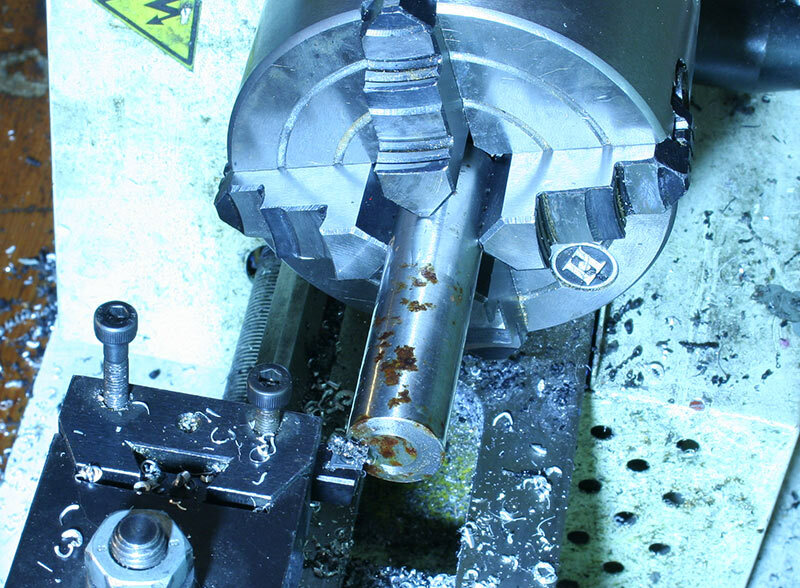 One of the best upgrades you can buy for your mini-lathe is a 4 jaw independent chuck. This allows you to hold and centre work pieces for more accurately than the 3 jaw chuck. It also allows you to hold irregular shaped jobs in any manner you choose. It certainly makes the mini-lathe for more flexible. 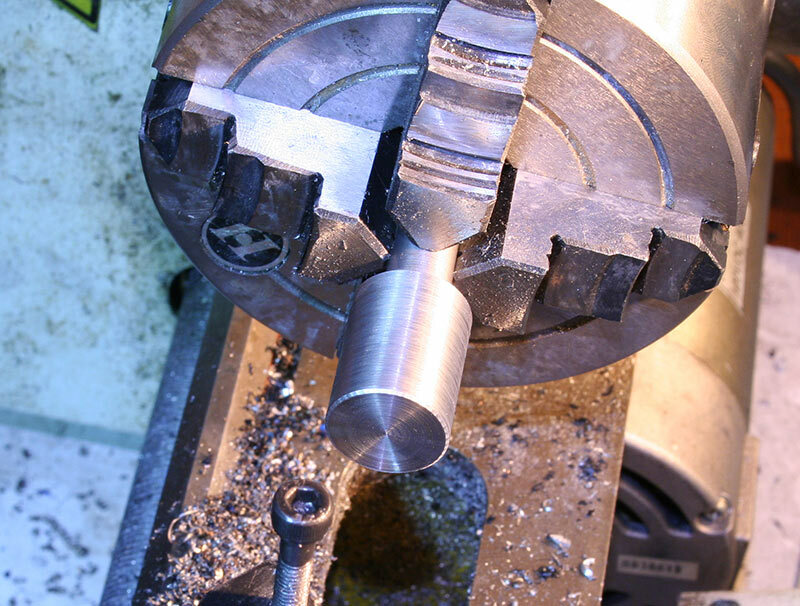 When centreing a job in the 4 jaw chuck you need to perform a process of loosening one side and tightening the opposite side. Whilst this is perfectly possible with one chuck key it is much easier if you have two chuck keys - one for each side. 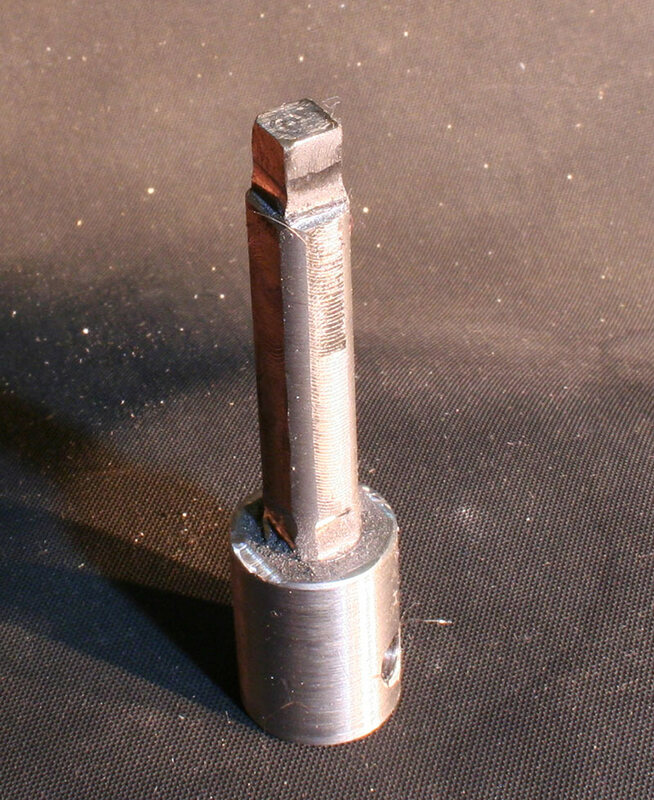 The standard chuck key for a 4 jaw mini-lathe chuck usually features a cross bar for getting the jaws very tight. Sometimes it is difficult to "fit" this sort of tool into the gap, so a chuck key with an optional T bar is also very useful. The simplest way of making such a key is to find some square steel stock about the right size and use that. However, you can make a chuck key from some regular round stock. One afternoon I was a bit bored, and lacking the required square stock, I decided to use some round silver steel (drill rod in the US) stock to make my own custom chuck key. Here is the raw stock. It is a bit rusty, having spent some time in the garden, and also in the deep freeze (don't ask!) so it has lost its precision ground surface. However, under the rough surface it is a really high quality bit of steel. 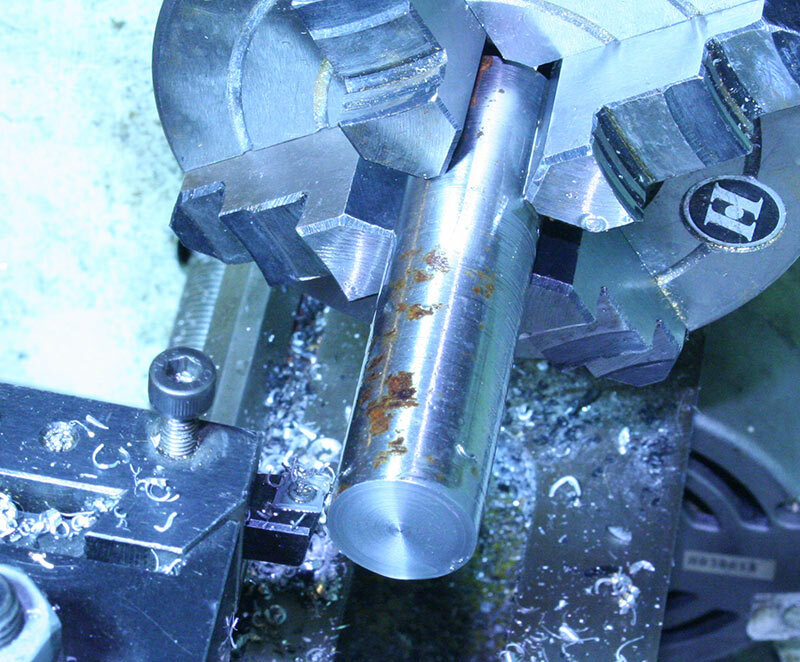 I chucked up the stock in my 4 jaw chuck on the mini-lathe and started by facing the end. 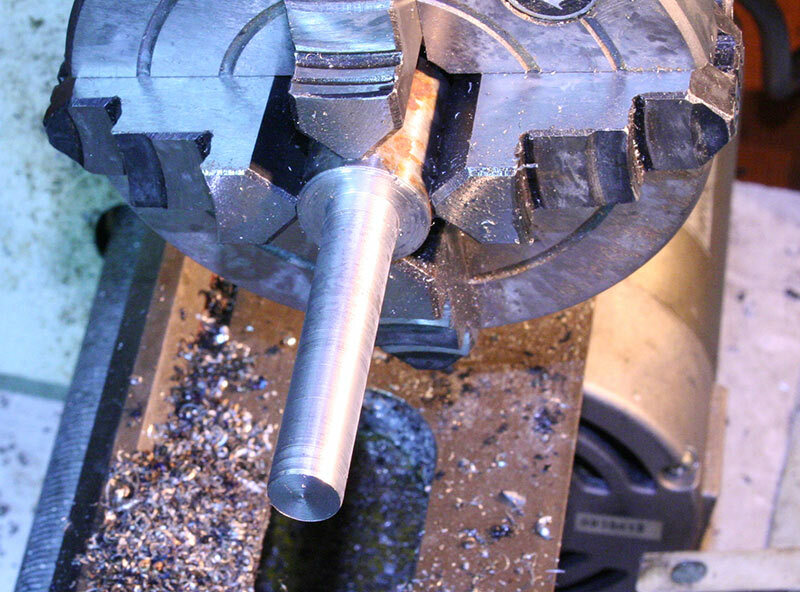 Most mini-lathe jobs start by facing the end! It is important to take very small cuts otherwise you risk the forces moving the part in the chuck jaws, or something worse. Now we need to turn down the shank of the tool. It needs so be about 10mm diamter, so that it does not interfer with the chuck jaws when they are at maximum extension from the chuck. The shank, according to my rough guess, needed to be about 55mm long, including the square end. 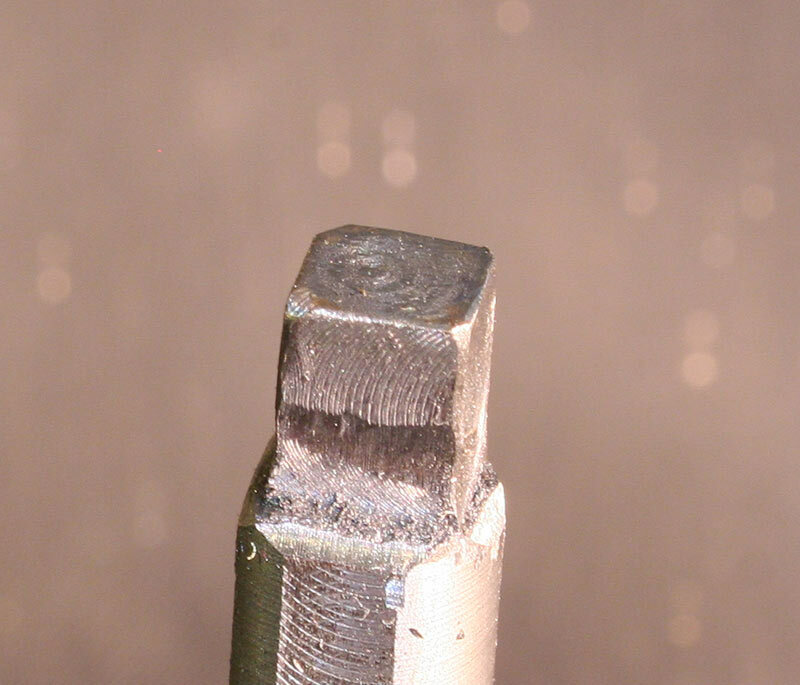 Here we can see the shank of the tool turned down to about 10mm. Now we need to remove the part from the 4 jaw independent chuck and turn it round. I centred it in the 4 jaw chuck and cleaned up the handle end of the part. There is no need for great precision here - it just needs the rust turned off the outside and the corners and edges smoothed to make it easy on the fingers. If I had a knurling tool, I might have been tempted to knurl the surface, but I don't have one, so I didn't! I intended this chuck key to be like a screwdriver - operated with the fingers. However by drilling a hole across the handle section I can optionally use another bit of metal as a lever. One of the delights of the 4 jaw independent chuck is the way you can mount irregular parts and drill a hole wherever you like. Because I am drilling into a rounded surface, it is important to use a small centre drill to start the hole. If we started with a regular drill there is a danger of the drill slipping. I finihed up with a 6.5mm hole. Finally I used my micro Sieg X1 mill to square the end to the same size as my existing chuck key. I then used a dremel tool to tidy up the edges and de-burr the sharp bits. It doesn't look particularly great, but it works very well. I have choosen NOT to harden the tip. Some people advocate hardening the end of a chuck key. This prevents the end wearing. However, if the chuck key isn't wearing, then the socket in the chuck is going to wear more. It is easier to make another chuck key than it is to make another chuck! 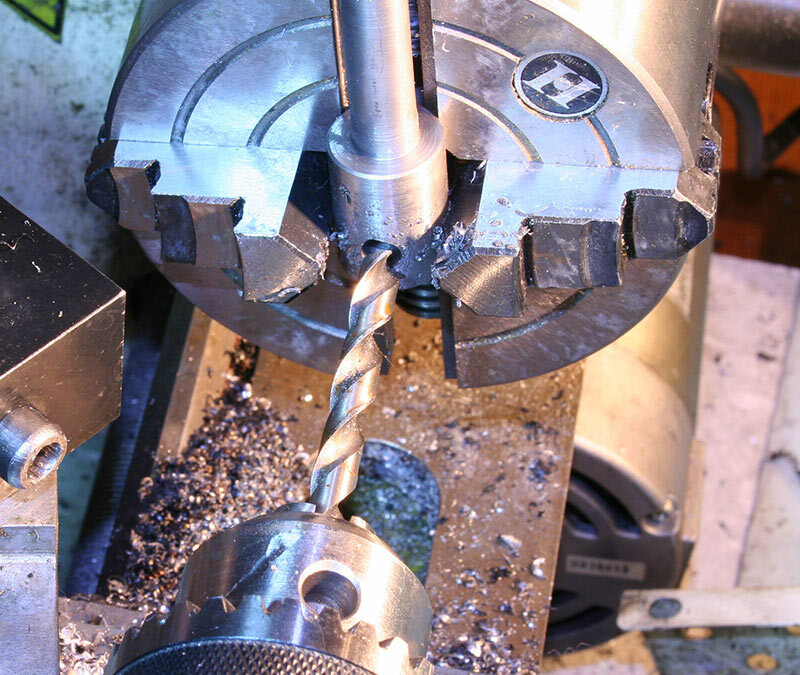 Therefore having the key softer than the socket in the chuck is a good thing!